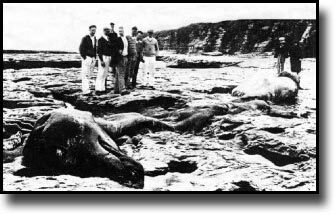 The history of South Laguna Beach California in pictures and stories. 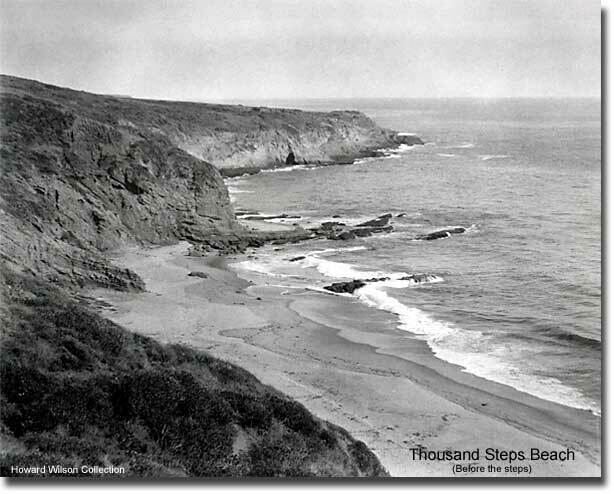 South Laguna from the 1900s with photos of Thousand Steps Beach, Aliso Creek, Paradise Cove and Three Arch Bay. The best look at South Laguna on the Web. See South Laguna now! 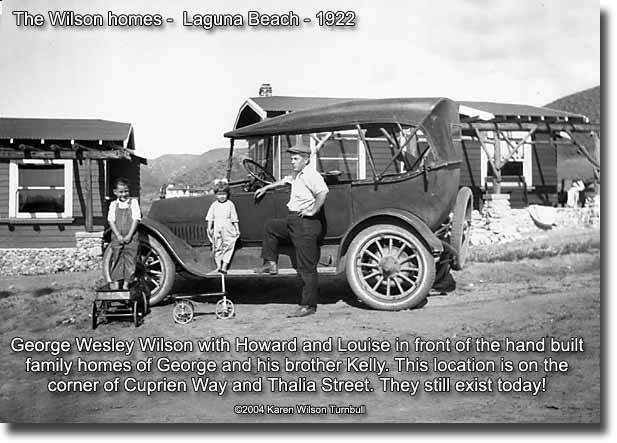 George Wesley Wilson was born April 1st, 1889 in Missouri and came west in 1907 settling in Laguna Beach in 1920. 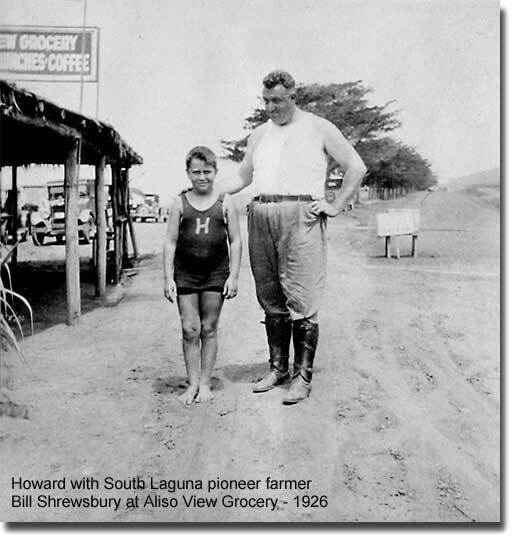 He built and opened a small grocery store in South Laguna along the one-lane dirt Pacific Coast Hwy in 1922. 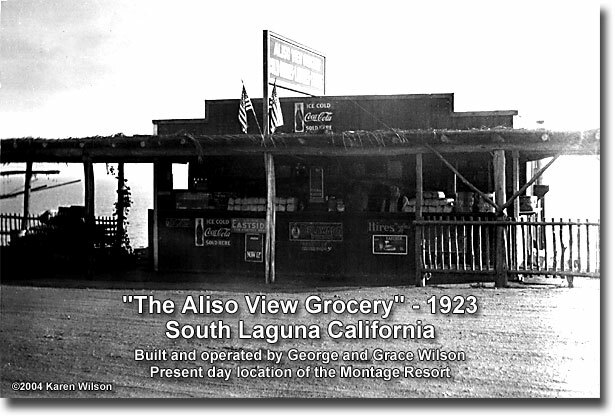 "The Aliso View Grocery" was located on the site of the present day Montage Resort. Nearby "Wesley Drive" is named after him, along with "Wilson Street" in Laguna Beach, where he maintained a residence. Grace Wilson and her mother Amanda Boyce are seen behind the counter, tending the "Aliso View Grocery" in South Laguna in 1923. In his later years, George Wilson once told me of the times that the 50-60 man U.S. Marine Cavalry would ride up from Camp Pendelton on horseback, and George and Grace would resupply the men with sandwiches and soda pop. Wish we had a picture of that! From the north side of Aliso Creek looking south toward Three Arch Bay. The building on the left is the back of the "Aliso View Grocery". The little building near the cliffs was built by George Wilson for his son Howard. When I met Howard in 1968 ( and later married his daughter! :) ), he told me that he "grew up in a little shack by the sea". Whoa! Howard was the master of understatement, eh? Young Howard ( with the "H" ) was well liked by the Shrewsbury farming family. They considered him as one of their own and allowed him to freely roam their holdings, explore their beaches and camp in their mountains. 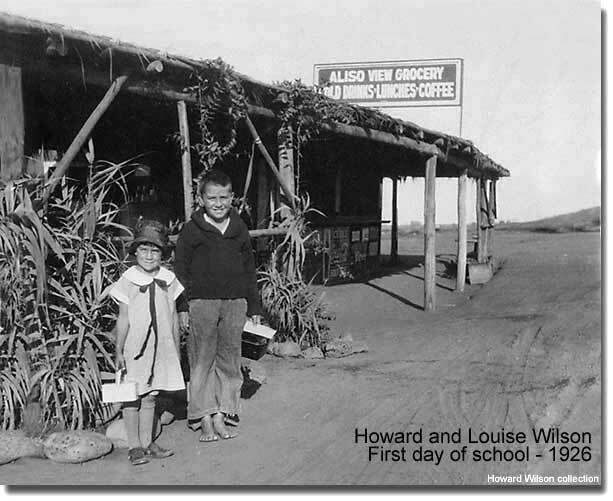 Howard became expert in his knowledge of South Laguna and it's history, especially the Indian history, because of this affectionate relationship. You can better see the mysterious Cypress trees planted here on the north side of Aliso Creek in a long straight line. A similar line of trees were on the south side of Aliso. No one knew the origin of these very slow growing trees back then, and as far as I know, their origin remains a mystery today. The following excerpt was recorded in 1973 then transcribed and published in 1975 in the book "From The Ozarks To Aliso" by Karen Wilson Turnbull, George Wilson's granddaughter, as part of her Master's Thesis in History at California State University at Fullerton. This is the verbatim transcription of that interview, and it has not been edited in the least. Straight from the horses mouth, so to speak. Karen: What made you decide to move down to Laguna? George: Well, we'd come down here (from Brea) two or three trips and liked it and found out there wasn't anybody much doing any building down here. We bought that acre of ground up there, Kelly and I did, and built a couple of cabins. By the time we got them built, there were two or three other guys that wanted us to do some work for them. We liked to fish, so we just decided to stay. Joe Jahraus was running that lumber yard all by himself then. He hauled it and drove his truck and delivered lumber and did the whole works by himself. When we built those cabins up on Thalia Street, he brought the lumber up there and delivered it himself. He'd leave his lumber yard wide open, drive off and leave it. It was a different time then. Joe Jahraus was just a wonderful person and I always liked to do business with him. He was always a square-shooter with me. He done a lot for people that worked for him. He helped out people there who really needed help, you know. Karen: Where was the first place you settled when you got to Laguna? George: It was up on Thalia and Cuprian Way. Kelly and I lived in a tent up there while we were building those cabins. The first time we came down, old man Isch's store was over there close to where the White House Cafe is now. We went in there and got some groceries and stuff. I had a ten dollar bill and gave it to old man Isch. He says, "I can't change it." I says, "Well, that's the only thing I've got right now." He says, "You can come back tomorrow and pay me." He didn't write down how much was owed him or nothin', you know." The next day I went in there to pay him and he says, "How much was it you owed me?" (laughter) So I just paid him. He just lost a lot of money. People would just go in there and get stuff and he never kept tab of nothing. From left to right: Amanda Boyce (mother of Grace), Howard, Grace, Louise and George Wilson. Where the heck do you think they found that Christmas tree? 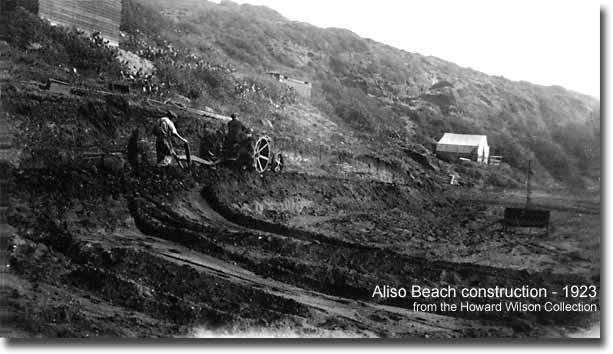 George Wesley Wilson, holding the plow, increases the amount of camping space at Aliso Beach in 1923. I believe the tractor operator would have been pioneer South Laguna homestead farmer Bill Shewsbury, as no one else around had a tractor. The tent and wooden structure can also be seen in the photograph below. Do you think George got a permit from the county first? Do you think the county even knew where Aliso Beach was? 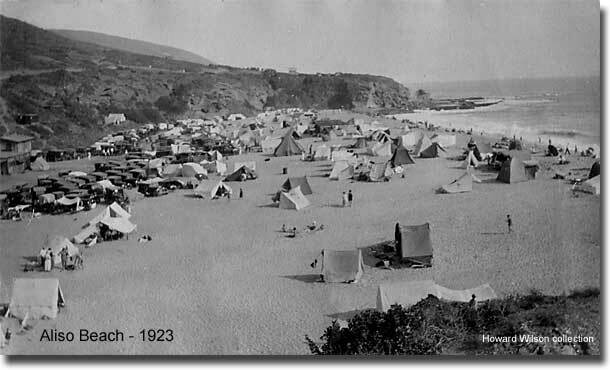 George Wesley Wilson ran the camping concern at Aliso Beach. In the book "From the Ozarks to Aliso", an oral history published by his granddaughter Karen Wilson Turnbull in 1975, he tells of the time when there was an outbreak of Hoof and Mouth disease in Orange County around 1924. "Oh, there were lots of them there all summer long. That year they had the Hoof and Mouth disease in the county, and we had to close up the entrance to the place. We couldn't get any more people in there. We had about 800 camps in, and they were fighting to get more in. They wouldn't let nobody go into the mountains or anyplace. Everybody came to the beach. We ran out of everything to eat and drink, and Laguna had no more food. It was sure a mess down there." 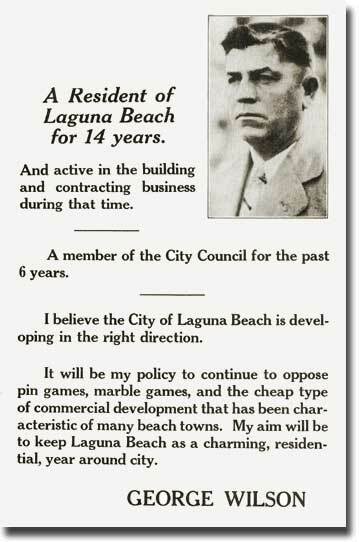 Here's a campaign poster for George Wilson, running for reelection to the Laguna Beach City Council in 1934. I was lucky enough to have known George in his later years, and despite the stern look on his face in this photo, he was really a compassionate, joy filled and loving man who shared his enjoyment of life with all who knew him. He was a master carpenter who built many of the homes throughout Laguna Beach, and around southern Orange County. In his spare time he would spend hours making wonderful wooden toys and furniture for the neighborhood kids. Later in life, when Laguna became too expensive for this humble man, he moved to Costa Mesa, but he and his wife Grace spent nearly all of their time camping and fishing along the Klamath River in northern California. Ever wondered what our coastal cliffs looked like before people began building huge homes all over them? Well, this is about as pure a landscape as you'll ever see. This photo, taken in 1922, reveals the lands' true and natural form. In the foreground is "Thousand Steps Beach" long before there were any steps leading down to it. "Paradise Cove" is the next beach south, here hidden by the cliffs. The huge and spectacular sea-carved tunnel at the north end of Three Arch Bay can be seen also. I lived in a tiny wooden cottage on the cliff edge at the south end of Paradise Cove, body surfing the famous wave below for nearly 27 years before moving my family to Three Arch Bay. I am very thankful for having known this beautiful place so intimately. In my minds eye, it always looked like this, and in my heart, it always will look like this. He told me of a bright and clear winter day sometime back in 1922, when he was playing in the family's Aliso view Grocery store, high on the cliffs above Aliso Beach overlooking the ocean. Something dark, way out in the water, caught his eye. He stopped what he was doing, went over to the window and took a closer look. His mother, Grace Wilson, came over to look too. They both stood in amazed wonder at the window, as they were looking at a very large creature with a black head attached to a long glistening black neck sticking up out of the water, and it was HUGE! It was moving serenely through the water heading south, turning it's head left and right as it cruised along. They watched it for several minutes as it traveled toward Three Arch Bay, finally disappearing as the projecting southern cliffs blocked their view. Grace: "Well, I don't know. You see these sea horses on television and they're little bitty things ...nothing big...but this was a real big thing. I'll never forget how that thing looked. Howard and I both know what it looked like. Has he said anything about it?" Howard confirmed the above account, and also told me that they both decided that it was probably some kind of creature "that got lost ...maybe it came down from Alaska". He told me of how he too would never forget how big it was. And how the colossal head looked left and right, how the neck would bend, and how the big eyes even blinked a few times. I asked if it could have been a tree trunk that might have washed out of one of the rivers to the north, but Howard said no. "It was much bigger then a tree. It would bend it's neck almost in two", as the gigantic head would occasionally dip down to the water, "then straighten back up. It turned it's head to look directly at the shore, and I saw the eyes blink." "No," he said, "It was alive." As a young boy growing up in a small town, he soon realized that others became skeptical when he told them what he and his mother had seen, and so he shut up about the whole thing. They both told no one but family members about this amazing day from then on. Not even when they later began to hear tales of a large creature seen in a Scottish Loch did they mention their amazing sighting. Now you may choose not to believe this story, but not me, because I knew Howard Wilson, and I know he wasn't joking - I could see it in his eyes. His mother was a simple, poorly educated girl just out from Missouri, who had no idea what type of sea life was normal or not, so what did she care? Howard was tightlipped about the incident throughout his life, and certainly wasn't looking for attention. 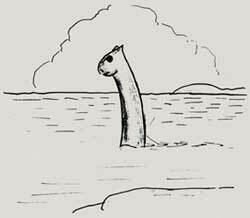 Besides, neither one of them had even heard of the Loch Ness creature yet, or had even seen a picture of a giraffe back then either for cripes sake, so why would they both make this up? 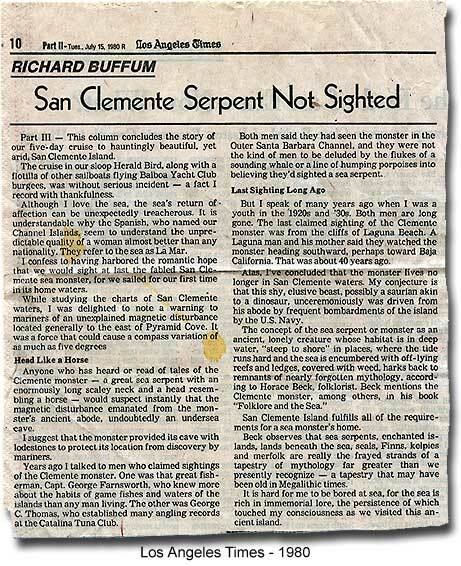 Richard Buffum, writing in his column for the Los Angeles Times in 1980, tells us of reliable sources besides the Wilson's who also saw this creature, but much earlier. 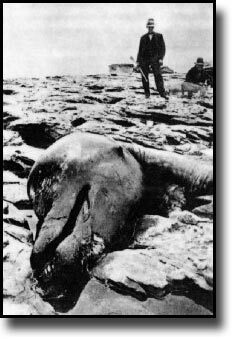 Oh...And by the way, take a look at these two photos of a sea creature that washed up on the rocks of Moore's Beach in Monterey Bay, California in 1925. 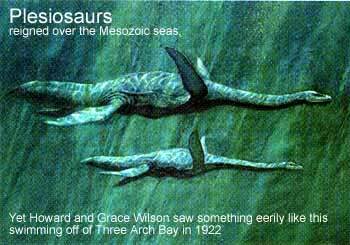 The neck was described as being about 20 feet long. The sardine fishermen there often reported seeing creatures like this in the 1920-40 era. It was hardly reported in the media. What is it? A rotting whale maybe? I don't know, but it sure looks suspiciously like the creature Howard and Grace tell of of seeing in 1922, don't you think? So anyway, I just wanted to tell the tale of an honest man and his mother, and what they saw. You can take it or leave it. But when I look out over the vast Pacific today, I know in my heart that something astounding went swimming by on that winter day so many years ago. And I wait for it to swim by again. 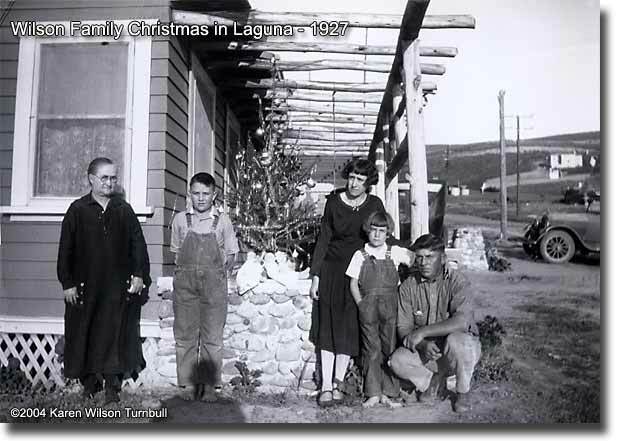 See MORE fascinating South Laguna historical photos!